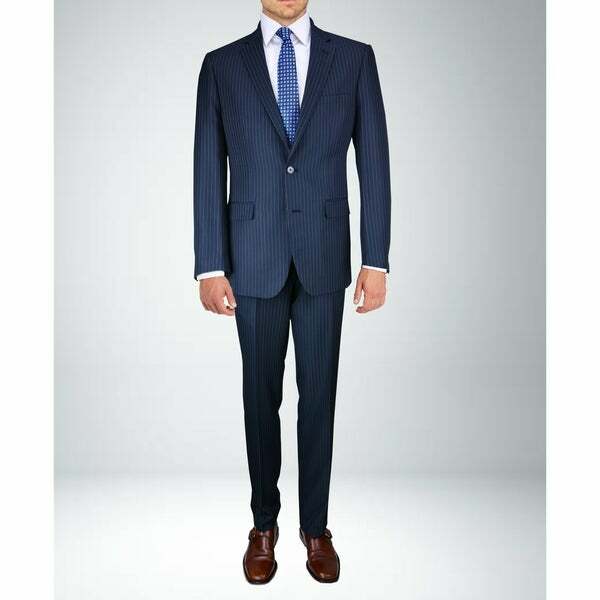 Look professional and sophisticated in this very dark mid-night blue (almost black) men's suit. Designed with ease of movement in mind, this suit offers comfortable wear from morning to evening. With just two buttons, the jacket comes off easily if you need more room to move during office hours. Enjoy the smooth sensation of soft rayon lining in this suit, and its 65 percent micro polyester and 35 percent viscose construction ensures a classic fit. Sit down easily with a double side-vented back that provides ample leeway. Numerous pockets both in the jacket and the pants give you room to stow essential belongings close at hand. NOTE: Suit may NOT be returned if hemmed. Dimensions 35.0 In. X 19.0 In. X 3.0 In.